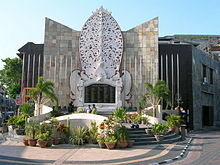 The 2002 Bali bombings occurred on 12 October 2002 in the tourist district of Kuta on the Indonesian island of Bali. The attack killed 202 people (including 88 Australians, 38 Indonesians, and people of more than 20 other nationalities). A further 209 people were injured. Retaliation for United States' support of War on Terror and Australia's role in the liberation of East Timor. Various members of Jemaah Islamiyah, a violent Islamist group, were convicted in relation to the bombings, including three individuals who were sentenced to death. The attack involved the detonation of three bombs: a backpack-mounted device carried by a suicide bomber; a large car bomb, both of which were detonated in or near popular nightclubs in Kuta; and a third much smaller device detonated outside the United States consulate in Denpasar, causing only minor damage. An audio-cassette purportedly carrying a recorded voice message from Osama bin Laden stated that the Bali bombings were in direct retaliation for support of the United States' War on Terror and Australia's role in the liberation of East Timor. On 8 November 2008, Imam Samudra, Amrozi Nurhasyim and Huda bin Abdul Haq were executed by firing squad on the island prison of Nusakambangan at 00:15 local time (17:15 UTC). On 9 March 2010, Dulmatin, nicknamed "the Genius" – believed to be responsible for setting off one of the Bali bombs with a mobile phone – was killed in a shoot-out with Indonesian police in Jakarta. A Mitsubishi L300 van like the one in which the car bomb was planted. At 23:05 Central Indonesian Time on 12 October 2002, a suicide bomber inside the nightclub Paddy's Pub (sometimes referred to as Paddy’s Irish Bar) detonated a bomb in his backpack, causing many patrons, with or without injuries, to immediately flee into the street. Twenty seconds later, a second and much more powerful car bomb hidden inside a white Mitsubishi van was detonated by another suicide bomber outside the Sari Club, a renowned open-air thatch-roof bar located opposite Paddy's Pub. The bombing occurred during one of the busiest tourist periods of the year in Kuta Beach, driven in part by many Australian sporting teams making their annual end-of-season holiday. Damage to the densely populated residential and commercial district was immense, destroying neighbouring buildings and shattering windows several blocks away. The car bomb explosion left a one metre deep crater. The local Sanglah Hospital was ill-equipped to deal with the scale of the disaster and was overwhelmed with the number of injured, particularly burn victims. There were so many people injured by the explosion that some of the injured had to be placed in hotel pools near the explosion site to ease the pain of their burns. Many of the injured were forced to be flown extreme distances to Darwin (1,800 km or 1,100 mi) and Perth (2,600 km or 1,600 mi) for specialist burn treatment. A comparatively small bomb detonated outside the U.S. consulate in Denpasar, which is thought to have exploded shortly before the two Kuta bombs, caused minor injuries to one person and property damage was minimal. It was reportedly packed with human excrement. The investigators were thus able to recreate the bombers activities. Amrozi, Idris and Ali Imron had simply walked into a dealership and purchased a new Yamaha motorbike, after asking how much they could re-sell it for if they returned it in a few days. Imron used the motorbike to plant the small bomb outside the U.S. Consulate. Idris then rode the motorbike as Imron drove two suicide bombers in the Mitsubishi to the nightclub district in Kuta. He stopped near the Sari Club, instructed one suicide bomber to put on his explosives vest and the other to arm the vehicle bomb. The first bomber headed to Paddy's Pub. Idris then left the second bomber, who had only learned to drive in a straight line, to drive the minivan the short distance to the Sari Club. Idris picked up Imron on the Yamaha and the duo headed back into Denpasar. Idris dialed the number of the Nokia to detonate the bomb at the Consulate. The two suicide bombers exploded their devices. Imron and Idris dropped the motorbike at a place where it eventually attracted the attention of the caretaker. The final death toll was 202, mainly comprising Western tourists and holiday-makers in their 20s and 30s who were in or near Paddy's Pub or the Sari Club, but also including many Balinese Indonesians working or living nearby, or simply passing by. Hundreds more people suffered horrific burns and other injuries. The largest group among those killed were holidayers from Australia with 88 fatalities. On 14 October, the United Nations Security Council passed Resolution 1438 condemning the attack as a threat to international peace and security. There were many acts of individual heroism. Kusitino 'Kossy' Halemai, a Wallis and Futuna-born Australian citizen who was managing the Bounty Hotel in Kuta at the time of the attacks, sheltered survivors in the immediate aftermath of the blasts. He was singled out for praise with the award of the Medal of the Order of Australia (OAM) on 13 June 2005. Husband and wife Richard and Gilana Poore, who organized a makeshift triage area in the Bounty Hotel's reception area, were both honored with an OAM. James Parkinson, an emergency nurse, worked alongside Doctor Hogg from Wollongong in the Denpasar Sanglah Hospital running the trauma centre for the bombing victims. After he disappeared in Africa and Europe for three years, the Governor General's department finally tracked him down and awarded Parkinson the Medal of the Order of Australia in 2005. Senior Constable Timothy Britten and Mr Richard Joyes of Western Australia were both awarded the Cross of Valour for their actions during the course of the day. The Cross of Valour is the highest civilian honor and is equivalent to the Victoria Cross for Australia which is the highest military honor. The Mitsubishi L300 van bomb was initially thought to have consisted of C4, a military grade plastic explosive which is difficult to obtain. However, investigators discovered the bomb was made from potassium chlorate, aluminium powder, and sulfur. For the Sari club bomb with the L300 van, the terrorists assembled 12 plastic filing cabinets filled with explosives. The cabinets, each containing a potassium chlorate, aluminum powder, sulfur mixture with a TNT booster, was connected by 150 metres (490 ft) of PETN-filled detonating cord. Ninety-four RDX electric detonators were fitted to the TNT. The total weight of the van bomb was 2,250 pounds (1,020 kg). The large, high-temperature blast damage produced by this mixture was similar to a thermobaric explosive, although the bombers may not have known this. The organization suspected of responsibility for the bombing was Jemaah Islamiyah, an Islamist group allegedly led by radical cleric Abu Bakar Bashir. A week after the blasts, Arab satellite channel Al-Jazeera put to air an audio-cassette purportedly carrying a recorded voice message from Osama Bin Laden saying that the Bali bombings were in retaliation for support of the United States' war on terror and Australia's role in the liberation of East Timor. "You will be killed just as you kill, and will be bombed just as you bomb", "Expect more that will further distress you." The recording did not however claim responsibility for the Bali attack. However, former FBI agent Ali Soufan confirmed in his book, The Black Banners, that al-Qaeda did in fact finance the attack. In addition, Hambali confessed that al-Qaeda had sent him $US30,000 to fund the bombings of the two nightclubs. The Indonesian chief of police, General Da'i Bachtiar said that the bombing was the "worst act of terror in Indonesia's history". Aris Munandar (aka Sheik Aris) is a Jemaah Islamiyah associate linked to Bashir. He is believed to have assisted the Bali bomber Amrozi in acquiring some of the explosives used in the Bali bombings. Philippine intelligence considers Munandar to be associated with Mohammad Abdullah Sughayer, a Saudi national Abu Sayyaf Group in southern Philippines. Munandar is still at large. A report by the United States-Indonesia Society describes the arrest of Amrozi and other suspects. General Pastika ordered his men to make the arrest early the next morning, November. Amrozi was asleep in the rear of the house. According to Greg Barton's account, Amrozi did not attempt to escape, but laughed instead, later exclaiming, ''Gosh, you guys are very clever, how did you find me?" Amrozi's mobile phone, a particularly important piece of evidence, was seized during his arrest. Bags of chemical ingredients for bombs were found in his workshop and soil samples taken from outside his home showed traces of the primary chemical used in the Sari Club bomb. Police found receipts for the purchase of chemicals used to make the bombs, as well as a list of expenses incurred in making the bombs. Further search of Amrozi's home revealed copies of speeches by Osama bin Laden, and Abu Bakar Bashir, the radical Indonesian Muslim cleric reputed to be the leader of Jemaah Islamiyah. The speeches exhorted listeners to wage jihad. Police also uncovered training manuals on ambush techniques and numerous articles on jihad. Under questioning Amrozi revealed the names of six others involved in the bombing: Ali Imron, Imam Samudra, Dul Matin, Idris, Abdul Ghani and Umar Patek. But Amrozi's mobile phone proved to be the real catch. Indonesian investigators were able to print out a list of calls he had made immediately before, during and after the bombing, as well as the names and telephone numbers in the phone's memory. Pastika kept Amrozi's arrest secret for two days. After it was announced, Polri monitored the sudden flurry of communications among numbers listed in Amrozi's telephone before the calls abruptly ceased. The investigators were able to identify the location of a number of the telephones, leading to a series of arrests. Indonesian authorities also believe more suspects remain at large. In 2005, Indonesian police arrested 24 additional people suspected of involvement in the Bali attacks and a 2003 bombing of the Marriott Hotel in Jakarta. On 12 October 2005, a story in Australian broadcaster SBS's documentary series Dateline, called "Inside Indonesia's War on Terrorism", argued that the Indonesian military or police may have been involved in executing the attack. On 13 June 2007, it was reported that Abu Dujana, who might have headed a terrorist cell in Bali, was captured. Just past midnight on 9 November 2008, the three convicted of carrying out the bombings (Imam Samudra, Amrozi Nurhasyim, and Ali Ghufron) were executed by a firing squad. Umar Patek was finally arrested in Abbottabad Pakistan in early 2011. The U.S. government had offered a US$1 million reward for his arrest. Patek is a suspect in other bombings as well as the one in Bali. In April 2003, Indonesian authorities charged Abu Bakar Bashir (also rendered "Ba'asyir"), the alleged spiritual leader of Jemaah Islamiyah, with treason. It was alleged that he tried to overthrow the government and establish an Islamic state. The specific charges against Bashir related to a series of church bombings on Christmas Eve in 2000, and to a plot to bomb United States and other Western interests in Singapore. He was initially not charged over the Bali attack, although he was frequently accused of being the instigator or inspirer of the attack. On 2 September, Bashir was acquitted of treason but convicted of lesser charges and sentenced to a prison term of four years. He said he would appeal. On 15 October 2004, he was arrested by the Indonesian authorities and charged with involvement in another bomb attack, which killed 14 people at the J. W. Marriott hotel in Jakarta on 5 August 2003. Secondary charges in this indictment accused him of involvement in the Bali bombing, the first time he faced charges in relation to this attack. On 3 March 2005, Bashir was found not guilty of the charges surrounding the 2003 bombing, but guilty of conspiracy over the 2002 attacks in Bali. He was sentenced to two and a half years imprisonment. The Australian, US, and many governments expressed its disappointment that the sentence was too short; in the outcome, Bashir was freed 14 June 2006 having served less than 26 months for his conspiracy, and on 21 December 2006, Bashir's conviction was overturned by Indonesia's Supreme Court. I do not know for sure the source of the aforementioned money from Hambali; most probably it was from Afghanistan, that is, from Sheikh Usama bin Laden. As far as I know, Hambali did not have a source of funds except from Afghanistan. Another operative, Wan Min bin Wan Mat, revealed to police that he had given Mukhlas money, at Hambali's request and that he understood part of the money had come directly from al-Qaeda. As noted below, all three were executed on 9 November 2008. The Australian, US, and many other foreign governments expressed satisfaction with the speed and efficiency with which the Indonesian police and courts dealt with the bombings primary suspects, despite what they characterized as light sentences. All Australian jurisdictions abolished the death penalty more than 30 years ago, but a poll showed that 77% of Australians approved of the death sentence for Amrozi. The Australian government said it would not ask Indonesia to refrain from using the death penalty. On 15 August, Riduan Isamuddin, generally known as Hambali, described as the operational chief of Jemaah Islamiyah was arrested in Ayutthaya, Thailand, the old capital one hour's drive north of Bangkok. He is in American custody in the Guantanamo Bay detention camp. On 23 July 2004, one of the convicted bombers, Maskur Abdul Kadir, successfully appealed his conviction. He had been tried under retroactive laws which were introduced after the bombing and which were employed to aid the prosecution of those involved in the attack. These laws were used by the prosecution instead of existing criminal laws as they allowed the death penalty to be imposed and lowered certain evidentiary restrictions. The highest court in Indonesia, the Constitutional Court, found by a margin of five to four that trying the terrorist suspects under these retroactive laws violated Article 28I(1) of the constitution . The minority judges argued that international human rights documents such as the International Covenant on Civil and Political Rights allowed an exception to not applying retrospective legislation in the prosecution of crimes against humanity. The majority found that this argument was inconsistent with the text of Article 28I(1) which states that the rights listed there "cannot be limited under any circumstances." Following this decision, charges related to the bombings against Idris, who had confessed to participating in the attacks to the police and court, were dismissed. The legal status of Kadir, Idris and others who might have their convictions quashed following the ruling on the retrospective law is unclear. The Constitutional Court is a relatively new body, created after the fall of Suharto, and this decision was one of the first to overrule the constitutionality of the government's application of a law. On 24 October 2008, Bali officials announced that three men convicted of carrying out the bombings would be executed by firing squad in November 2008. On 25 October 2008, Communications and Information Minister asked the Indonesian media to stop calling the three "heroes". The Denpasar District Court, on 3 November, accepted a reprieve motion to reconsider the death sentences. Fahmi Bachmid, a lawyer for the family of Jafar Sodiq, a brother of Amrozi and Mukhlas, stated: "We lodged the judicial review to Denpasar court to question (previous) decisions." Lawyer Imam Asmara Hadi stated: "We have lodged an appeal because we haven't received a copy of the Supreme Court rejection of our previous appeal." Indonesia's Supreme Court denied previous petitions for judicial review amid the constitutional court's dismissal of the bombers' appeals. Denpasar court official Nengah Sanjaya said the 3-page appeal would be sent to a Cilacap, central Java court. But the Attorney General's office said on 1 November the execution was "very close." Supreme Court judge Djoko Sarwoko, however, said a "last-minute legal challenge by the relatives of Imam Samudra, Amrozi Nurhasyim and Ali Ghufron will not change or delay the execution." They were moved to isolation cells, and execution spots were ready on the Nusakambangan island prison where they were being held. Local chief prosecutor Muhammad Yamin said they would be "executed simultaneously" but at different locations. Imam Samudra, Amrozi Nurhasyim and Ali Ghufron were executed by firing squad after midnight on 9 November 2008 (West Indonesian time). In the final moment, there was no remorse or repentance, and they shouted: Allahu Akbar, or "God is great!" For burial, Mukhlas and Amrozi's bodies were flown by helicopter to Tenggulan, Lamongan, East Java, while Imam Samudra's body was flown to Serang, Banten, amid "welcome martyrs" banner displayed at the cemetery. The execution caused high tension and sparked clashes in Tenggulan between hundreds of police and supporters. Indonesian singer and TV presenter Dorce Gamalama attended the funeral of Imam Samudra. After praying with the crowd, she spent half an hour in the house of the executed man and spoke with his mother. On leaving she was quoted as saying "I'm certain he's gone to heaven". Maaruf Amin, deputy chairman of the Indonesian Ulemas Council, the chief body for Islamic clerics in Indonesia said of the men: "They did not die a holy death. That can only be in a war and Indonesia is not at war." A permanent memorial was built on the site of the destroyed Paddy's Pub on Legian Street. (A new bar, named "Paddy's: Reloaded", was reopened further along Legian Street). The memorial is made of intricately carved stone, set with a large marble plaque, which bears the names and nationalities of each of those killed. It is flanked by the national flags of the victims. The monument is well-maintained and illuminated at night. The memorial was dedicated on 12 October 2004, the second anniversary of the attack. The dedication included a Balinese Hindu ceremony and the opportunity for mourners to lay flowers and other offerings. The Australian ambassador and Indonesian officials attended the ceremony. The Balinese mark their commitment in a nine-day-long event. After major cleansing ceremonies, establishing a memorial for the lost lives, and paying respect to those who left loved ones behind, the people of Kuta look forward to restoring Bali's image through an event named "Kuta Karnival — A Celebration of Life". The community event consists of traditional art performances such as Balinese Sunset Dances, sports on the beach as well as in the water for young and old plus rows and rows of culinary displays along the one kilometre of sandy beach. In line with the return of tourism to Kuta, Kuta Karnival has grown into a tourism promotional event with major coverage from television and newspapers from across the globe. Companies, embassies, Non-Government Organizations, associations and even individuals come forth to get involved in the various events such as a Balinese dance competition presented by a surf-wear company, an environment exhibition presented by an embassy, a fun cycle presented by a group of individuals, a seminar presented by an association and a parade on the streets presented by an NGO. Tourists and locals alike, more than ninety thousand people participates in the numerous events, year after year. A repeated tragedy in Bali in 2005 did not reduce the Kuta community's determination to carry out this annual event. Kuta Karnival is conducted to commemorate and give respect to the victims of human violence and show the world the true spirit of local community survival despite terrorism attacks. On 12 October 2010, Australian and Indonesian survivors of the 2002 bombings attended a solemn commemoration service to mark the eighth anniversary of the devastating attacks. In Lincoln Square on the western side of Swanston Street, Melbourne, is a memorial representing the 88 Australians who died in the bombings, and notably the 22 from Victoria. There are 88 jets in the fountain; at night there are lights representing all those who died. 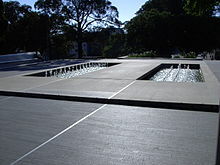 The fountain shuts off and becomes a reflecting pool on 12 October each year. This was one of the very few fountains allowed to operate during the drought in 2007. One Melburnian survivor of the bombings was Jason McCartney, who was playing in the AFL for North Melbourne. He suffered second-degree burns to over 50% of his body while helping carry others to safety and nearly died during surgery after being transported back to Melbourne. But what a moment this is, for not only Australia, not only for AFL football, but for the free world as well. Now, I'm not trying to overdramatize things...this shows terrorism, as I said, will never beat courage. Welcome back indeed, Jason McCartney, an inspiration to all. On 6 June 2003, after a long rehabilitation process, McCartney successfully returned to action for the Kangaroos in the Round 11 (Queen's Birthday) match against Richmond in front of 43,200 people at Docklands Stadium (Telstra Dome), and the match – featuring the two Victorian teams in the top 8 (in finals position) heading into the round – functioned as another memorial to those lost during the bombings. McCartney, who was heavily bandaged and wore protective gloves, wore the numbers "88" and "202" on the front of his long-sleeved guernsey, signifying the Australian and total numbers of victims, while many in the crowd held up signs saying "Bali 88/202". Other Australian victims were honored in a video shown on the stadium's video screens before the game, and representatives from five Australian rules football clubs who lost players in the attacks were presented to the crowd. Retired Melbourne player Steven Febey and young Demon Steven Armstrong, who suffered shrapnel injuries in the blast, also attended the match. Normally a defender, McCartney came on as a substitute at full forward to cheers from both sets of supporters, and early in the fourth quarter, he took a mark inside the forward 50-metre line and kicked a goal from the resulting set shot to put the Kangaroos ahead by nine. With two minutes remaining and the Tigers having retaken the lead by three points, he also collected a bouncing pass inside the forward 50 and kicked the ball through to Leigh Harding, who finished the goal from close range to put the Kangaroos ahead again to stay. North Melbourne eventually won by 13.14 (92) to Richmond's 13.11 (89). McCartney announced his retirement from the AFL during his emotional on-field post-match interview, citing that his road back had left him spent and that he preferred to leave on a high note. To this day, it is considered one of the most inspirational sports-related stories in Australia, with Fox Footy's AFL: The Greatest ranking it as #7 on its list of the biggest AFL news stories of all-time. The image of McCartney being chaired off the ground after the game is also captured in Jamie Cooper's painting The Game That Made Australia, commissioned by the AFL in 2008 to celebrate the 150th anniversary of Australian rules football. Hired by the Western Bulldogs as their list manager, McCartney went on to win the AFL Premiership that had eluded him as a player during the Bulldogs' surprise 2016 season (McCartney had been suspended for the 1999 Grand Final, which North Melbourne had won against Carlton.) He is currently the list manager for the Greater Western Sydney Giants and a successful motivational speaker. He also published an autobiography, After Bali, recounting his ordeal after the bombings and his road back to the AFL, and also married Melissa Vanderheyden, who he had been engaged to before the bombings, just 63 days after the attacks. A medal named after McCartney is also awarded to the most courageous player during contests between North Melbourne and Collingwood, McCartney's original team. 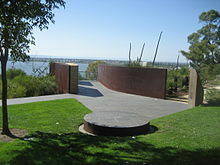 A memorial which lists the victims of the bombings from Western Australia was opened on the first anniversary, and is situated on the ridge of Mount Eliza in Kings Park, overlooking the city. The memorial is specifically designed to frame the sun's rays at dawn on 12 October each year and faces in the exact direction of Bali. An Indonesian-style stone memorial is situated in Allambe Memorial Park at Nerang. A bronze plaque lists the names of the 88 Australians who died in the bombings. An annual twilight service is held at the site of the memorial on each anniversary of the Bali bombings. Memorial at Dolphin Point, Coogee Beach, to 20 of the Australian Bali bombing victims who were residents of Coogee and its neighbouring suburbs. On the northern side of Coogee Beach a memorial to the Bali bombing victims comprises three interlocking bronze shapes that have an abstract resemblance to three bowed figures supporting each other. There are also some graffiti memorials in memory of the dead. A memorial to seven residents of Sutherland Shire who were victims is at Cronulla. Called The Seed, the work is based on the seed and foliage of the Banksia robur, a native plant indigenous to the Shire. This sculpture of pink sandstone is the centrepiece of the memorial. It is set in a black granite pond located in 'Peryman Place' not far from North Cronulla Beach, frequented by many of the seven victims and their families. Two plaques are set into the granite surrounding the pond. The plaques carry the victims' photos, names, and ages; and also details of the event, the design's symbolism, its dedication, and a poem written by the families of the victims. The work is by sculptor Chris Bennetts and Ishi Buki Sandstone Sculpture. South of Sydney, in the town of Ulladulla, a large youth centre is being built as a memorial to Craig Dunn and Danny Lewis, two local victims of the bombings. Money is being raised through the Dunn & Lewis Youth Development Foundation. A granite cube serves as a memorial in the Eastern Formal Gardens of Parliament House. On the fourth anniversary of the bombings Prince Charles and Camilla, Duchess of Cornwall unveiled a memorial in London, at the rear of the Foreign and Commonwealth Office Main Building, facing St. James's Park. The memorial consists of a 1.5-metre marble globe, to represent that people from 21 countries were killed, and has 202 doves carved into it. The names of all 202 victims are on a curved stone wall behind the globe. It is the work of the artist Gary Breeze and the sculptor Martin Cook. In 2005, two marble wall placards were unveiled at Hong Kong Football Club in memory of the members of the club who were killed in the bombings. Every year since 2002, the Rugby Section of the Singapore Cricket Club (the "SCC") has held a dawn memorial service on the Padang (the SCC's rugby field in central Singapore) on the anniversary of the bombings,to honour the memory of the eight players which the SCC lost (Neil Bowler, Chris Redman, Dave Kent, Peter Record, Tim Arnold, Chris Bradford, Chris Kays and Charlie Van Rennen). The service is attended by survivors of the 2002 rugby tour to Bali, friends and family of those who lost their lives, as well as current and past players of the club. The SCC also maintains a permanent memorial to the players it lost inside the club's main lounge. A remembrance garden was constructed at the International School Ho Chi Minh City commemorating teachers from that school who were killed in the bombings. In 2006, Long Road to Heaven, an Indonesian feature film about the bombings, was released by Kalyana Shira Films. The film was directed by Enison Sinaro and written by Wong Wai Leng and Andy Logam-Tan. It stars Raelee Hill, Mirrah Foulkes, Alex Komang, Surya Saputra, John O' Hare, Sarah Treleaven, and Joshua Pandelaki. It tells the story during three different times: the planning a few months before the bombing, its execution in 2002, and the trials in 2003 through the viewpoints of both the victims and the bombers. The story is not chronologically linear, starting with the explosion and then moving from time to time so as all three plots are culminated one after the other. At the beginning of each scene, subtitles tell the date and location of the scene. A 130-page comic book about the first Bali Bombing has been launched to promote peace and discourage radicalism and terrorism in Indonesia. The book, titled Ketika Nurani Bicara (When Conscience Speaks), tells about the bombing from the perspective of three people: a volunteer who helped evacuate a bombing victim who lost her husband in the blast; the victim who struggled to raise her children without her husband; and a terrorist who regrets his involvement in the bombing. Bali Boom Boom, a 2004 pоrnographic film, contains amateur footage recorded at Paddy's Pub and Sari Club before and after the bombings, in which several of the performers died. The film's tagline was "Police couldn't catch us, the terrorist didn't even get us." A Seconds from Disaster episode named "Bali Bombings" was a documentary telling the story of what happened, and looking at what happened after the incident. ^ a b AFP (6 October 2003). "'Al-Qaeda financed Bali' claims Hambali report". Sydney Morning Herald. Retrieved 5 July 2016. ^ "Bali death toll set at 202". BBC News. 19 February 2003. Retrieved 14 July 2010. ^ "The Sydney Morning Herald". The Sydney Morning Herald. Retrieved 24 November 2015. ^ "Bali bomber mastermind Dulmatin killed in shoot-out". 9 March 2010. Archived from the original on 14 June 2017. Retrieved 5 April 2011. ^ a b West, Brad (December 2008). "Collective memory and crisis: The 2002 Bali bombing, national heroic archetypes and the counter-narrative of cosmopolitan nationalism". Journal of Sociology. 44 (4): 337–353. doi:10.1177/1440783308097125. Retrieved 29 June 2015. ^ "Bali bombings 2002". International Activities. Australian Federal Police. Archived from the original on 18 June 2006. Retrieved 18 March 2007. ^ "terror layout 2" (PDF). Archived from the original (PDF) on 12 July 2010. Retrieved 1 July 2010. ^ Park, Andrew (10 October 2012). "Bali bombings: Full list of victims' names". SBS Australia. Retrieved 28 June 2015. ^ Bachelard, Michael; Andrew Forbes; Rodolfo Pazos. "The first Bali bombing: ten years on". Sydney Morning Herald. Retrieved 29 June 2015. ^ McMahon, Neil (12 June 2005). "Tears came much later for Bali rescuer". Sydney Morning Herald. Retrieved 24 January 2010. ^ HALEMAI, Kusitino, Medal of the Order of Australia (OAM), 13 June 2005, Citation: "For service to the victims and families affected by the bombings which occurred in Bali on October 12, 2002 and to continuing support for an international recovery program for Bali." ^ POORE, Richard Beresford, OAM, August 22, 2005, Citation: "For service to Australia by providing assistance to the victims of the bombings which occurred in Bali on October 12, 2002 and to their families. ", itsanhonour.gov.au. Retrieved 21 March 2010. ^ POORE, Gilana Lea, OAM, 26 January 2005, Citation: "For service through the provision of assistance to victims in the immediate aftermath of the bombings which occurred in Bali on October 12, 2002, and subsequently to the people of Bali. ", itsanhonour.gov.au. Retrieved 11 March 2012. ^ PARKINSON, James, Medal of the Order of Australia, January 26, 2005, itsanhonour.gov.au. Retrieved March 21, 2010. ^ N. C. Asthana; Anjali Nirmal (2009). Urban Terrorism: Myths and Realities. Jaipur: Pointer Publishers. p. 263. ISBN 978-81-7132-598-6. Retrieved 19 July 2014. ^ Nicholson, Brendan (15 June 2006). "Bashir's release a cause of great pain". The Age. Melbourne. Retrieved 19 September 2006. ^ admin (14 December 2012). "The Death Penalty - a matter of principle". www.humanrights.gov.au. Retrieved 20 December 2018. ^ Michelle Cazzulino (30 October 2008). "Relieved Bali bombing victims want chapter closed". The Daily Telegraph. UK. Retrieved 8 November 2008. ^ AAP (30 October 2008). "Bali bombers already brought to justice, Kevin Rudd says". The Daily Telegraph. UK. Archived from the original on 7 December 2008. Retrieved 8 November 2008. ^ "Minister Asks Media not to Call Amrozi Et Al: "Heroes"". Antara News. 25 October 2008. ^ Irwan Firdaus (9 November 2008). "Indonesia executes Bali bombers". The Jakarta Post. Archived from the original on 12 November 2008. Retrieved 9 November 2008. ^ "Dorce Hadiri Pemakaman Imam Samudra (Dorce attends funeral of Imam Samudra)". Detik.com (in Indonesian). Archived from the original on 7 December 2008. Retrieved 9 November 2008. ^ Boulton, Martin (27 December 2009). "Count to 10 and play - 2000-2009" – via Brisbane Times. ^ "Memorial for Shire victims of Bali bombings". Archived from the original on 29 October 2009. Retrieved 30 November 2009. ^ "Dunn & Lewis Youth Development Foundation". Archived from the original on 25 September 2008. Retrieved 5 October 2008. ^ Ward-Jackson, Philip (2011). Public Sculpture of Historic Westminster: Volume 1. Public Sculpture of Britain. 14. Liverpool: Liverpool University Press. pp. 79–80. 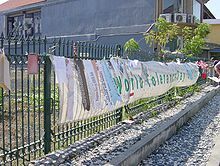 Wikimedia Commons has media related to Monuments and memorials to the victims of the 2002 Bali bombings.